The show kicks off right where it ended previously at Hollywood, with the bunch feeling lost once again after finding out that the supporters and dancers were paid to play the part of the ending. But much to their surprise, a sequel is ordered and there they go again searching for a new story to tell. 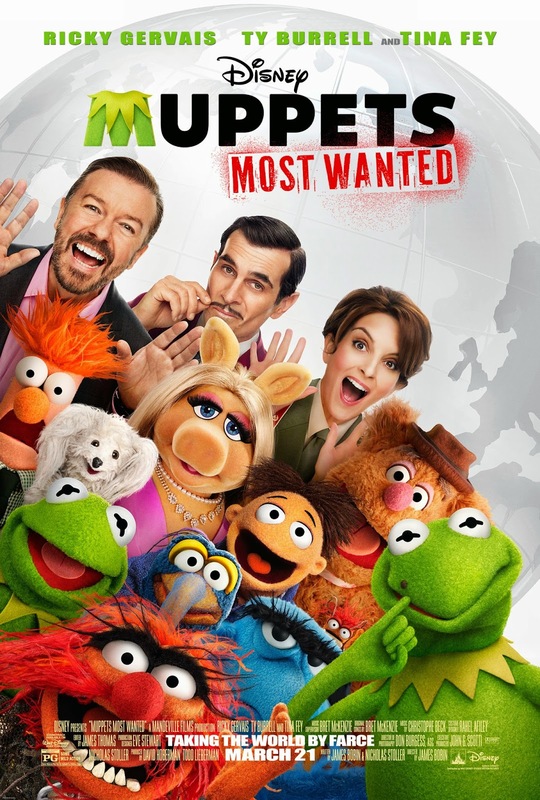 Dominic Badguy (played by Ricky Gervais) suggests to go on a world tour, which the Muppets’ leader, Kermit the frog, is persuaded to accept, not knowing that Badguy’s actually working with a self-proclaimed world’s no. 1 criminal named Constantine, who looks like Kermit. 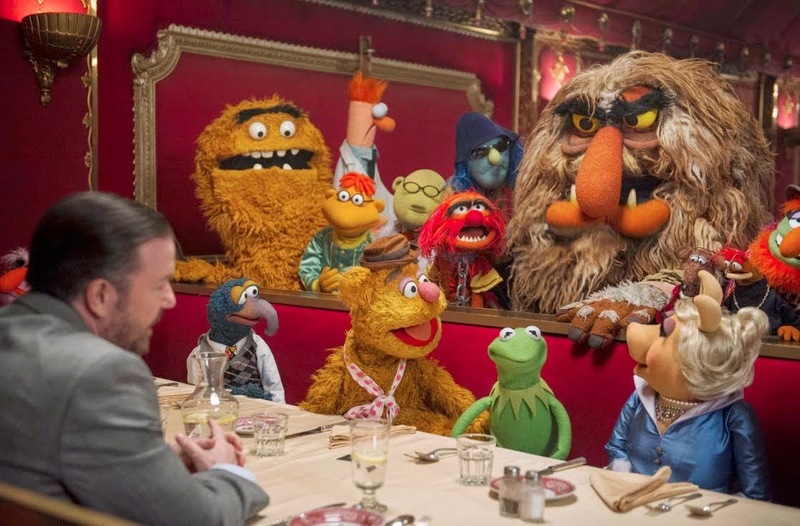 Constantine breaks out of prison and switches place with Kermit as part of his escape and heist plans, and nobody in the Muppets notice it except Animal. As you can already sense, the plot is formulaic and overused, with cliches written all over it. Can’t quite think of a title as an example now, but you’d know, the usual – someone in a group is taken for granted, gets replaced without anyone missing the old fellow, and then at the end everyone realises that he’s the one they really need. After all the mess created by the villains, it just ends with sort of how it begun, without any care for a proper closure. I wouldn’t let it pass off as a parody of the genre, instead, I’d just say it’s lazy. It’s probably ’cause Jason Segel (who’s the main actor and co-writer of the previous film) did not come back to write the script with Nicholas Stoller. Practically the entire show was predictable to me, which causes slight boredom here and there, but thank goodness for the good humour (breaking “the fourth wall” a lot as usual), catchy tunes (the musical scenes are quite adorably funny indeed) and the amount of celebrity cameos (from Lady Gaga to Christoph Waltz to Tom Hiddleston a.k.a. Loki, just to name a few without spoiling it for you) that’s so random, it’s hilarious. The puppeteers did a fantastic job again, making the The Muppets as lively and effectively expressive as always. I was particularly amused and impressed by Matt Vogel, who gave voice to the Russian villain Constantine, and many other characters in the film. Tina Fey and Ty Burrell are funny as hell, did a pretty good job with those accents too. Ricky Gervais, however, proves that he can’t really be that funny if he’s not the writer of his own bold and harsh scripts. Anyway, it ain’t easy making a movie like this, that has obsolete puppets and generic storyline, so watchable perhaps to both adults and children. And therefore, my hats off to director James Robin, but he probably shouldn’t have co-written the film as well. Censorship in Malaysia: No way there’s anything to cut, even by our local film censorship board’s inconsistent standards. Second opinion: My girlfriend felt the same way as me. She liked the previous one better as well, saying that this sequel is partly funny, partly boring. Verdict: Basically not as good and magical as 2011’s The Muppets but entertaining enough despite its boring cliched premise.